Buddhists believe that giving without seeking anything in return leads to greater spiritual wealth. Dana is a concept in Buddhism that means generosity or giving. It is also the practice of cultivating generosity. 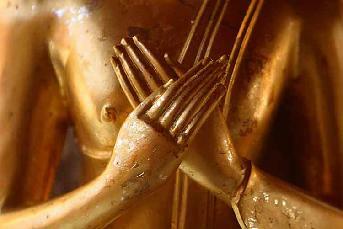 Ultimately, the practice culminates in one of the perfections (pāramitā): the perfection of giving. It is characterized by unattached and unconditional generosity, giving and letting go. Many Buddhist retreats operate on the concept of dana. My yoga and meditation training at Spirit Rock operated on a sliding scale fee basis and on the last day you also gave what you could afford to pay to all the teachers and staff. I was inspired to write after reading Blisschick’s post on her installation of a donation button on her blog. Like Blisschick, I don’t have ads on this blog and also like her, I have written many words over five years — this is my 400th post! — and very much appreciate the relationships I have developed because of this blog. More than a few people have written to me over the years about how inspired they were by my words (“I thought I was the only one to feel this way!”) or how I have helped their yoga practice in some way (for example, my many posts on yin yoga.) This blog is a global teaching tool just as much as my yoga classes are locally. My friend wrote a book containing her family recipes because she wanted to share her knowledge, she thought it valuable enough. More importantly, she valued herself enough to do that. Her words reminded me of what the teachers told us at KYM: that we should spread our knowledge, because if we did not, we would be nothing more than thieves, taking but not giving. So, like Blisschick, my time and energy and words and experiences are worth something, and I have had a Paypal donation button on the right side for some some time now. If some bloggers can ask their readers to help pay for their yoga teacher training, then I will also graciously accept and appreciate your dana, gratitude, and love offerings. A heartfelt “thank you” goes out to the readers who have donated a few rupees over the years! Of course, readers are free to ignore the donation button, it’s your choice. But if you have benefited in some way or learned anything from this blog in five years, then consider what that knowledge — indeed, the wisdom of an ageless hippie chick Buddhist yogini — has been worth to you. Metta to all my readers! How much we think about these things! I contemplate the banker or the CEO of a company or even a librarian — all those people with skills who see nothing wrong with the expectation of PAY. Yoga teachers, artists, writers, all of us…we ALL deserve to feed ourselves with our True Work, ya know? We all deserve to expect it. you got that right, lady! I think I finally GOT IT when I fully realized that yes, I AM teaching people via my words just as much as when I teach a class. I can see which posts are most important to people on the site meter. and also, what my friend said…. I think a book could be a great idea! Funny. My name is Dhana, and when I lived in Japan I studied with a (Canadian) rinpoche?? (I know) His name was (is) Doug Duncan. We had lovely study groups at homes in Kyoto and Kobe, at the end the Dhana bowl would be passed around. It is a lovely way to live.